My “new guy BBQ” happened on schedule. I met a handful of the local builders and had a great time talking about the kit and getting some advice from the guys who built their cars. Mikey and Mike and Larry and Julie and Julie and Frank and JJ and some others are now new friends. Even with name tags, I still can’t remember everyone’s name – and I didn’t take enough pictures – so this means another gathering will have to happen again soon! The guys helped me remove the rear body shell from the chassis. (Actually, they did most of the work.) This was an important step, because now I can start building the car. I marked and removed all the chassis aluminum panels. 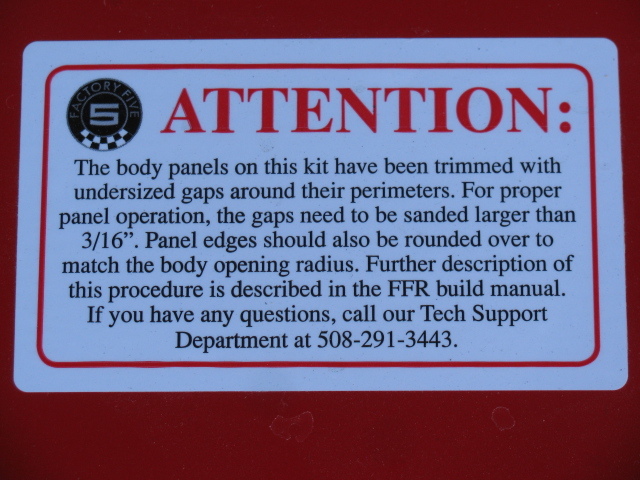 Some panels were stuck or wedged solidly in place against the frame without any fasteners. The trunk floor is going to be very difficult to put back in – I had to pull, bend and twist the sheet to get it out of the car. While doing this, I made some pretty deep scratches in the side panels and the chassis. I think cutting the trunk floor in half lengthwise will make it easier to put into place. We’ll see. Here are some pictures from the gathering…. 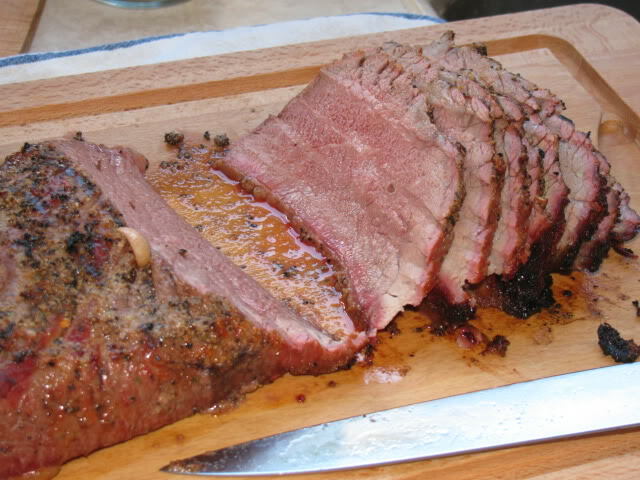 While some people slept, I started roasting a pair of tri-tip roasts on the Big Green Egg. . . The BGE was still at cooking temperature, so I added some sausages . 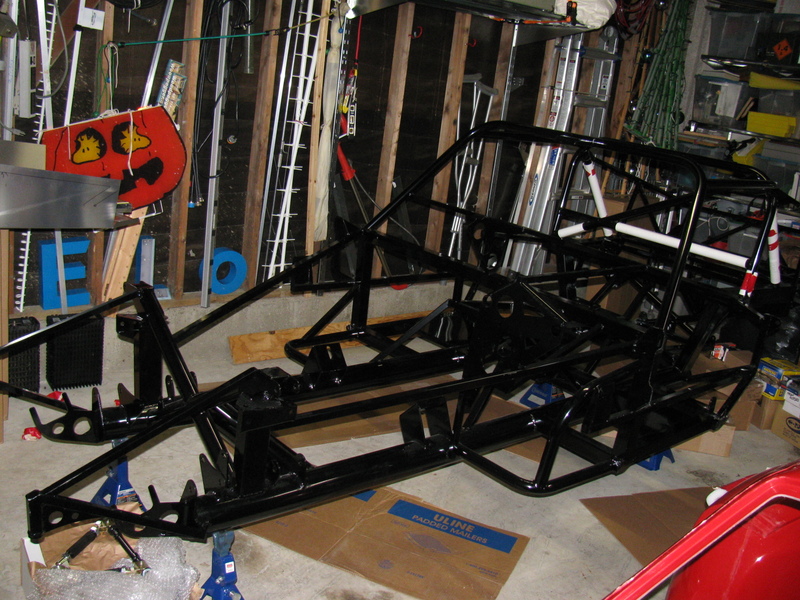 .. .
33 Hot Rod by Erik – it is low and black and mean! Thanks to the guys visiting today, the body shell was removed – a significant step – since the project begins with un-building all of the sheet aluminum panels from the chassis. Remember Jim Carrey as a package delivery man in the movie “Pet Detective”? He must have delivered these two boxes to my house earlier this week. These boxes look pretty bashed. Notice the bulges? Heavy stuff rattling around inside. Inside lumpy box one is the differential, with no packing materials in it. The “pumpkin” weighs 69 pounds. It was rolling around inside the box, trying to break out. Lumpy box two contained the rear spindles, 25 pounds. Differential for the Coupe Independent Rear Suspension. What’s missing? Packing material. 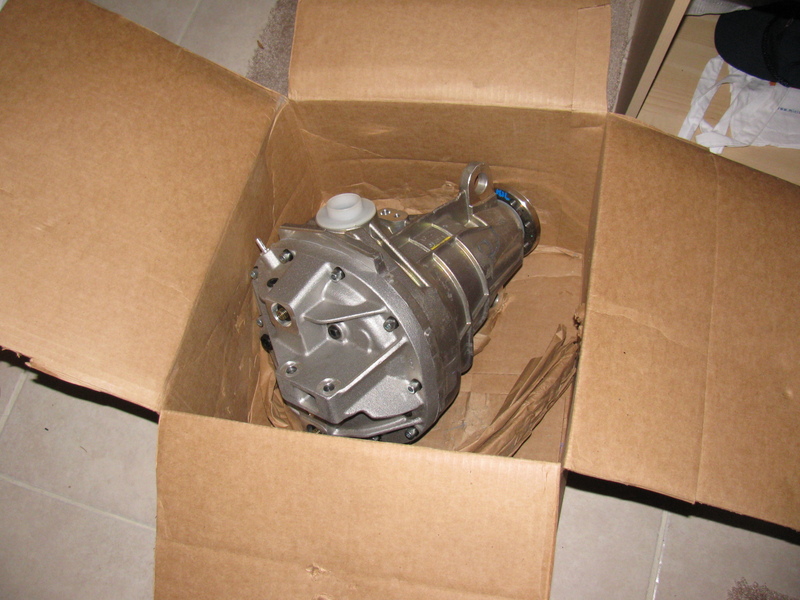 There’s 69 lbs of cast metal and lots of gears just rolling around inside a single-ply cardboard box. Lumpy box number 2 contained the rear spindles. Amazingly – nothing seems to be damaged. While these items are very robust, I wonder if shipments like this got damaged or lost while in transit – the box containing the spindles had many holes in it – the threaded studs were pounding against the box. These parts are part of the “drop ship” items for the Coupe build, so Factory Five Racing did not pack the parts this way – their supplier did. I sent a message to the F5R guys as a heads-up, so hopefully this will get corrected. Halibrand wheels, rear brakes, engine headers, body scoops, radiator bottom mounting piece, CV rear axles and some other stuff have not arrived, but I have enough parts to start building! My friend Dennis took these photos of the big delivery on October 9, 2012. This was a tough delivery for Bob from Stewart Transport, since the delivery day was set right in the middle of a street re-surfacing week. The shipment had to be dragged on the dolly from the end of the street to my house, since the Stewart trailer is 70 feet-plus long, and could not make the right angle turn to my driveway. Make a note of this and if you are not sure, verify with the Stewart Transport people about what is required (turning radius) to get to your house. I have had large cranes on my street (when a new air conditioning unit was installed at my house), but I think the crane may have been very wide, and not really long. Another thing to consider is how much room you have to store all the boxes you will get. I received 24 large boxes – enough to fill one side of my two-car garage. It took me two full days to take inventory of what I received, and I still need to check the “chassis-mounted parts.” Some items are on back-order, and I hope to see them soon. Here are some pictures of the Big Day, taken by Dennis. The other images of the kit and parts were taken by me. The famous Stewart Transport trailer with the built-in crane unloads a fresh Factory Five Racing Type 65 Coupe. The Type 65 Coupe on the dolly at the end of my street. Bob from Stewart Transport and the first dolly-load of boxes. I used a stack of not yet emptied boxes as my desk while taking inventory. Twenty-four boxes total. I selected the Auto Meter gauge package from Factory Five Racing for my Coupe. 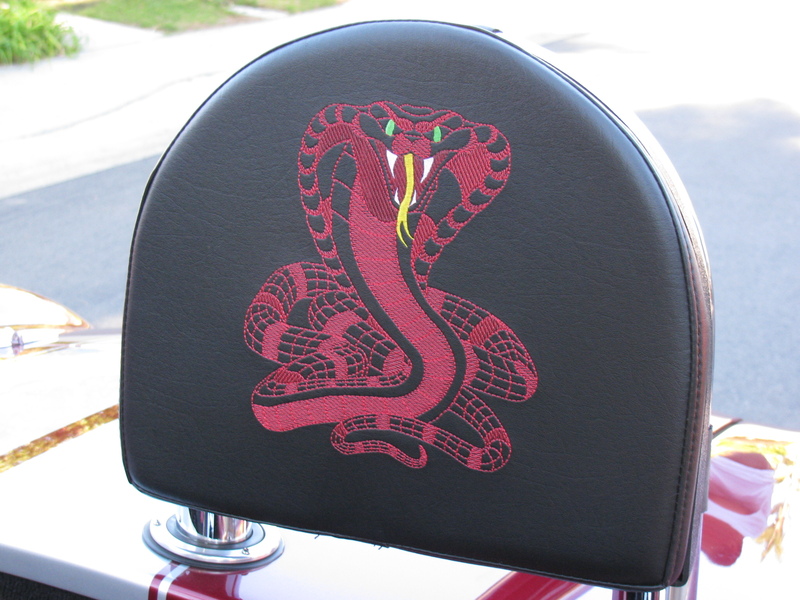 Beautiful wiring harness kit from Ron Francis Wiring. I always wondered what that warning sticker said on all the Factory Five Racing hoods. 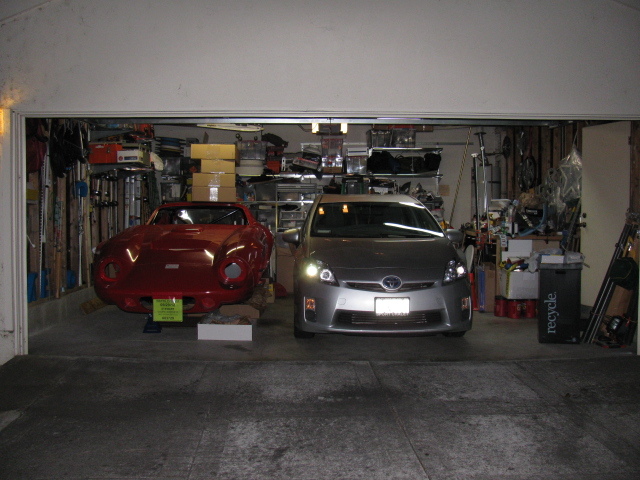 At the end of the second day, both the Coupe and Prius are in the garage. The Building Phase begins – soon. Stay tuned! This afternoon, Bob from Stewart Transport called – the big day finally arrives – Delivery is set for Tuesday afternoon. Two pairs of jack stands and a floor jack are needed to move the shipment into the shop – check. All ready for the delivery! I am not going to post any “before” pictures of the garage.